There's excellent Japanese food and an extensive bar list at Umu, says Vicki Aldaba. THE SETTING. The Dusit Thani Hotel Manila. The interior integrates Japanese and Western design, using quintessential Japanese prints, dark wood against expansive windows and dramatic lighting. You have an impression of distinct zones: the Robata grill and bar, the Teppanyaki live cooking tables, and the Western-style dining room. THE FOOD. The menu honors the Robata tradition of sharing and sampling. 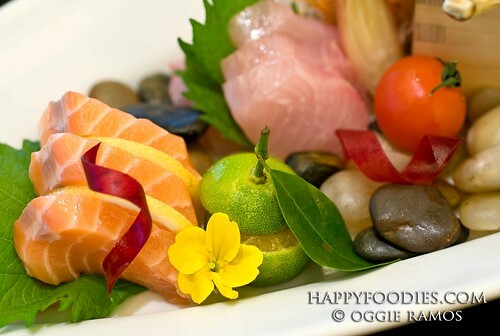 Try the sashimi gosyumori (P1,190 or about US $24), five different types of fish served with bentade leaf & fresh wasabi. The day I dined with friends at Umu, we had hamachi, salmon, toro, red snapper and marinated mackerel. There’s fusion sushi on the menu, which combines traditional sushi and international condiments such as kochijan sauce and cheese. Exploring the extensive bar list, there is the namachozo sake (P1,200), perfect chilled or on the rocks. 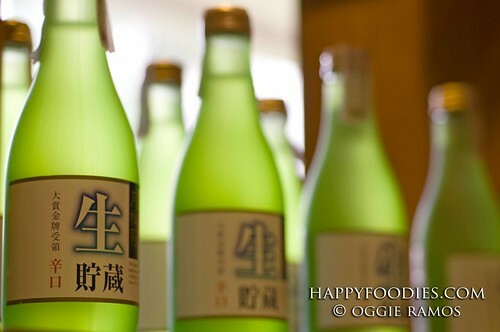 This sake is typified by its mellow flavor, fresh-fruity fragrance and smooth character. 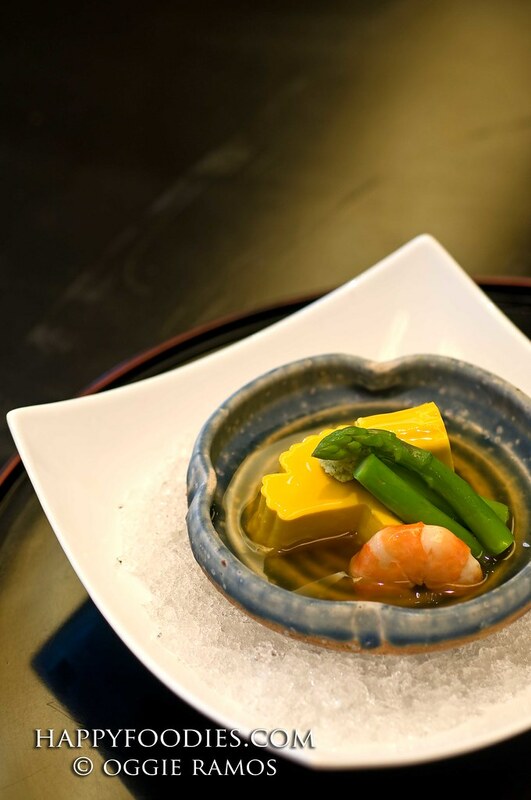 Next, Chef Kiyo Ogawa prepared and served us nankin tofu (P250), hand-made pumpkin tofu topped with prawn, asparagus and wasabi simmered in fish stock with rice wine. From the teppanyaki table, waif steak (150g at P750), ribeye angus with teriyaki mustard sauce. You can choose and make your own ala carte teppan combination. THE SERVICE. Warm, attentive and all-smiles. The staff knew the menu well. THE PRICE. Average price of a full course meal with drink per person is P1,100++. I recommend their happy hour (Monday to Friday 5:30pm-7:30pm) for eat-all-you-can sushi and robata for P750. If you haven’t indulged, you must go and experience the hotel’s Crossover buffet. Move from one restaurant to the next and savor from a large variety of dishes and regional specialties of three cuisines: Thai (Banjarong), Italian (Tosca) and Japanese (Umu). Sundays at P1,450; child 50%off. THE VERDICT. Delicious possibilities are limited only by the whims of your palate and your appetite. 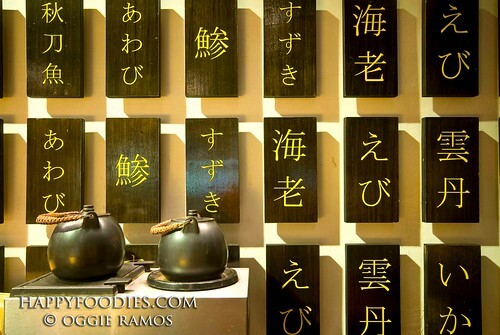 Umu is located at the Dusit Thani Hotel Manila, Makati, next to the Ayala Center. 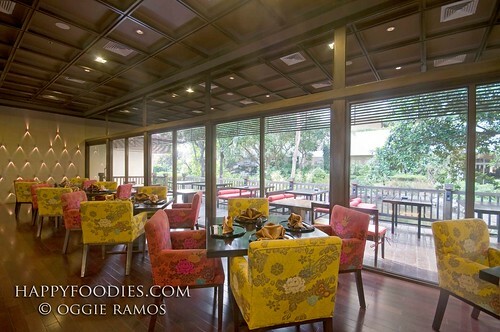 For reservations, call +632/ 867 3333. Looks like a very nice Japanese restaurant. I find the sushi super. we'll definitely try this bai. im a fan of japanese food. by the way, meron na rin akong viet tokens na nasa header mo. love the fabrics on those chairs on the last image. i can't say i'm particularly a japanese food fan, but i simply adore sushi and sashimi. Your pictures are crystal clear! Amazing. What camera are you using man? My pics are nothing compared to yours... by the way, nice adventures huh! Thanks Filip, Dom, Photo Cache and Jepoi. Jepoi: I use a Nikon DSLR. Thanks for dropping by.